Could your puppy be overweight? If your puppy’s body shape hasn’t slimmed down as they’ve grown, then ask your vet to check if your puppy is the right weight. 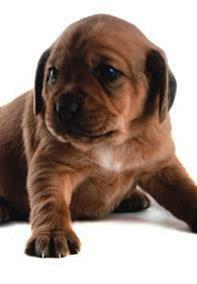 At eight weeks, healthy puppies have big tummies and waddle slightly as they walk. But if your puppy’s shape doesn’t slim down as they grow, their weight could harm their fast-growing skeleton – and lead to health problems in adult life. • Wet food is more filling, and contains fewer calories per gram than dry food – so if your puppy’s on dry food, consider switching. • Giving your puppy leftovers or table scraps could upset a carefully balanced diet and mean your puppy needs extra food just to get the important nutrients they need. • Gradually reduce portion sizes until your puppy’s finishing each bowl of food in 15-20 minutes. • From about four months, your puppy only needs four meals a day (big breeds might take a little longer to reach this stage). • An overfed puppy won’t be able to manage two half-hour walks a day, so take it easy at first until you’ve built up their stamina. • To wean your puppy off table scraps without them harassing you at mealtimes, you could offer them tasty Pedigree® Puppy Tubos® as part of their daily dental care regime instead. • When your puppy pesters you for a walk, they know what they need!